The diagnosis of acute and chronic HBV infection can be made using the serologic tests described previously. However, the ability to perform quantitative tests in serum for HBV DNA is useful in several settings: (1) to diagnose some cases of acute HBV infection; (2) to distinguish replicative from non-replicative chronic HBV infection; and (3) to monitor a patient's response to antiviral therapy. Determination of the HBV genotype will likely be used in the future to help predict response to antiviral therapy and can be performed with a commercially available line probe assay (INNO-LiPA HBV Genotyping Assay, Immunogenetics N.V., Ghent, Belgium) . 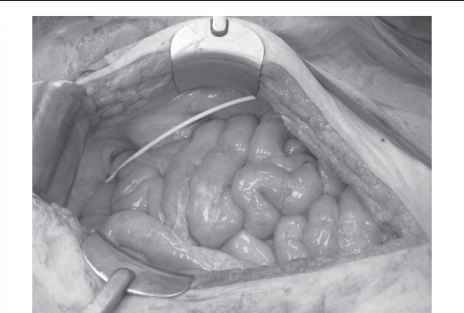 In most instances, the diagnosis of acute hepatitis B can be made with se-rologic testing for HBsAg. Coincident with the appearance of HBsAg in serum, markers of active HBV replication and infectivity, specifically HBeAg and HBV DNA, appear. If the results of tests for HBsAg are equivocal, assays for HBV DNA in serum may be a useful adjunct in the diagnosis of acute HBV infection. Moreover, HBV DNA can be detected approximately 21 days before HBsAg appears in the serum . Thus, HBV DNA assays may be used to diagnose acute HBV infection in those patients with high-risk exposures, such as needlestick accidents in health care workers. Assays for HBV DNA in serum are also used to characterize the replica-tive state of chronic HBV infection. Patients with chronic HBV infection may continue to display markers of active viral replication or may cycle between an active replicative and a nonreplicative state (see earlier discussion). Patients who cycle from a nonreplicative state to an active replicative state are said to have reactivated HBV infection. Reactivation of HBV infection may occur with or without reappearance of HBeAg in serum. With the increasing sensitivity of molecular assays that allows quantification of HBV DNA levels, the threshold that distinguishes the replicative from the nonreplicative state has been defined as 105 copies of HBV DNA/mL. These assays allow patients to be classified as having replicative, nonreplicative, or reactivation HBV infection. Furthermore, in patients with precore or core mutations resulting in HBeAg-negative chronic HBV infection, HBeAg cannot be relied on as a marker of active viral replication, and detection of HBV DNA is necessary for confirmation of an active replicative state. In addition to characterizing the status of viral replication in patients with chronic HBV infection, quantitative HBV DNA assays are useful in monitoring response to antiviral treatment. Recently, the National Institute of Diabetes and Digestive and Kidney Diseases and the American Gastro-enterological Association proposed criteria to define response to antiviral therapy based on biochemical (BR), histologic (HR), and virologic response (VR) . BR refers to a decrease in serum ALT to the normal range, and HR refers to a decrease in histologic activity index by at least 2 points compared with findings on a pretreatment liver biopsy. A critical component of VR is undetectable HBV DNA levels (< 105 copies/mL) with the use of an unamplified assay (see later discussion) and loss of HBeAg in serum in patients who were initially HBeAg-positive. For patients with HBeAg-negative chronic HBV infection, however, the only measure of virologic response is loss of HBV DNA. For patients with HBV infection who are treated with lamivudine, the emergence of a lamivudine-resistant strain is characterized by the reappearance of HBV DNA in serum after an initial decline in level or disappearance. There are both qualitative and quantitative assays for HBV DNA. However, the qualitative, PCR-based, assays are not necessary to assess the success of treatment of HBV infection, characterized by suppression of HBV DNA in serum, which can be adequately assessed by quantitative, non-PCR-based, HBV DNA assays. Quantification of HBV DNA in serum is performed using either signal or target amplification techniques. Signal amplification techniques require the use of a specific "capture" oligonucleotide probe that hybridizes to denatured DNA . Then, the signal (radioisotope, chemi luminescence) from the probe-DNA hybrid is amplified for detection and quantification , Target amplification requires amplification of the viral genome (amplicons); the amplicons are then detected and quantified. 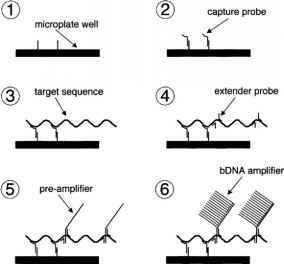 Assays using signal amplification include liquid hybridization (Genostics assay, Abbott Laboratories, Chicago, Illinois), the Hybrid Capture System (Digene Hybrid Capture II HBV DNA Test, Digene Corp., Gaithersburg, Maryland), and a branched DNA (bDNA) assay (Bayer, Emeryville, California). The liquid hybridization assay uses iodine 125-labeled nucleic acid probes that hybridize to soluble, denatured HBV DNA . After hybridization, the radiolabeled probes are detected and quantified using a gamma scintillation counter . The sensitivity of liquid hybridization is 6 x 105 copies/mL or l-2 pg/mL . 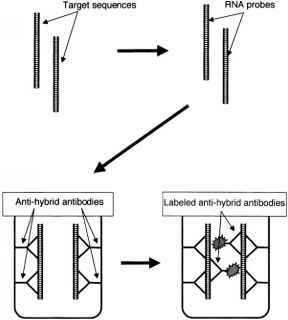 universal capture antibodies specific for the hybrids. The captured RNA-DNA hybrids are then detected using multiple antibodies (creating signal amplification) conjugated to alkaline phosphatase. The bound alkaline phosphatase is detected with a chemiluminescent dioxetane substrate that produces light, which is then measured. The signal can be amplified 3000 fold. The sensitivity of the Hybrid Capture System is 4700 copies/mL . amplification occurs when bDNA amplifier molecules are hybridized to the target HBV DNA hybrids in the microwell. Multiple repeat sequences within the bDNA amplifier molecule are then conjugated with an alkaline phosphatase-catalyzed chemiluminescence probe similar to that used in the Hybrid Capture System. The lower limit of detection for the bDNA assay is 7 x 105 DNA equivalents/mL . Although the signal amplification techniques offer highly specific assays to detect HBV DNA, they are unable to detect low levels of HBV DNA (< ~ 5,000 copies/mL). Target amplification techniques such as PCR-based assays are highly sensitive with the ability to detect as few as 10 copies/mL of HBV DNA (TaqMan-based PCR) . PCR assays rely on the use of specific primers that attach to each strand of target dsDNA, Then, new DNA strands are synthesized and amplified behind the primer. This cycle of DNA denaturing, primer annealing, and strand synthesis is repeated multiple times, thereby resulting in amplification of the target HBV DNA. The most common primers used in HBV DNA PCR assays are complementary to the precore or core region , Commercially available assays include the Amplicor HBV Monitor Test, v2.0 (Roche Molecular Systems, Pleasanton, California) and the Cobas Amplicor HBV Monitor Test, v2.0 (Roche Molecular Systems, Pleasanton, California). The ranges of HBV DNA detection are 1000 to 40,000,000 copies/mL and 200 to 200,000 copies/mL, respectively. The Cobas Amplicor system is the more sensitive of the two assays and uses an Amplicor analyzer that automates the amplification and detection process. Recent advances in PCR technology include the development of "realtime" PCR techniques to increase the sensitivity of the assay. Real-time PCR refers to the simultaneous amplification and quantification of viral genomes, thereby obviating the need for post-PCR manipulations [23,24]. Real-time PCR can detect a wide range of HBV DNA levels and offers a more rapid assay than conventional PCR techniques. In a recent study, LightCycler (LC)-PCR (Roche Diagnostics, Pleasanton, California), a real-time PCR technique, was compared with the Hybrid Capture II HBV DNA test (Digene Corp., Gaithersburg, Maryland) , and LC-PCR was found to be rapid (~2.5 hours) and 500 times more sensitive than Hybrid Capture II, with an HBV DNA detection range of 250 to 2.5 x 109 copies/mL. Currently, real-time PCR using the TaqMan probe is the most sensitive quantitative HBV DNA assay and is able to detect as few as 10 copies/mL [22,25]. TaqMan technology uses a fluorescent probe annealed to target DNA sequences for quantification of DNA [26,27].